Phil tells me he's lost friends score-chasing in Waves, but I don't play score attack games any more. Not since the incident. However, if you're up for straining your relationships with a glow-in-the-dark twin-stick shooter, Waves 2 (Waves Squared, I should say) will be crashing into Early Access on December 16. 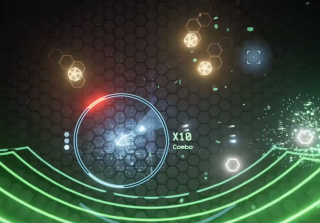 The original Waves had you rolling around a cyberspace arena with the distinct air of Geometry Wars, blasting swarms of corrupt processes trying to take down your network. The sequel doesn't look like a dramatic departure at this juncture, although the arena has changed shape and it certainly looks sharper. Developer Squid In A Box has scheduled Early Access to last six months as new weapons, modes, power-ups and enemies are added.